Pool starts out with a practice game where you can get the hang of shooting the cue ball. 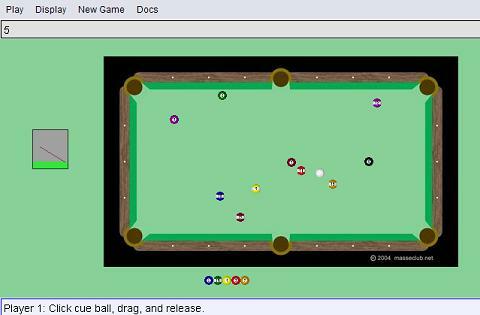 First you must place the cue ball on the table with the mouse (behind the second white dot from the left). Click on the cue ball and then drag the mouse. You will see a stick and black line appear. Aim the black line at the ball you want to hit. The longer the line is (i.e., the farther you drag the mouse), the more power you will have when shooting. To start a game against the computer, choose New Game->Against Computer->9 Ball from the menu. To host a game, select New Game->Host Online Game and pick the type of game. Enter a name at the prompt. To join a game that a friend is hosting, select New Game->Connect To Online Game and enter the name that your friend put in at the prompt. Choose New Game->Local and then select a game from the list.